Students and staff gather outside Elijah Smith Elementary for Monday's ceremony. Photo: Tim Kucharuk/CKRW. The shelter and fire pit at Elijah Smith Elementary will have a variety of uses not only by students and staff, but the public as well. 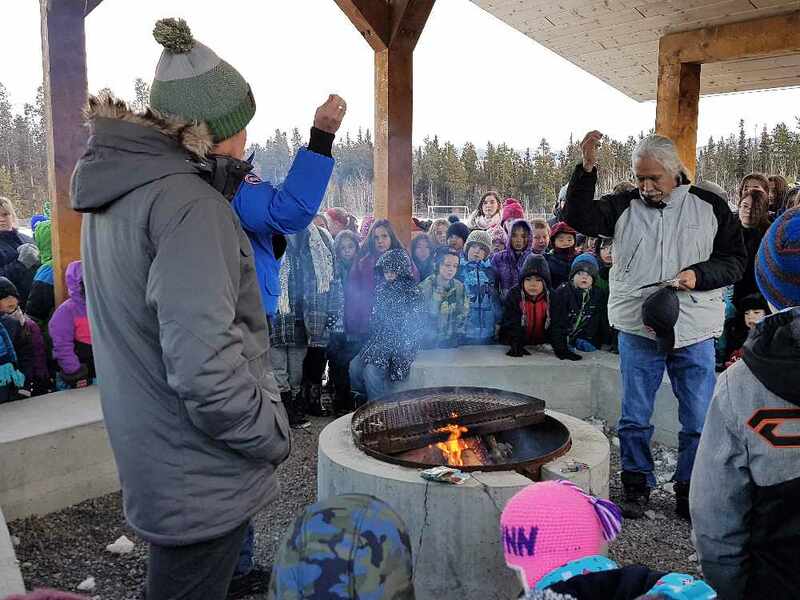 Students and staff at Elijah Smith Elementary School in Whitehorse are welcoming a recently-completed fire shelter. 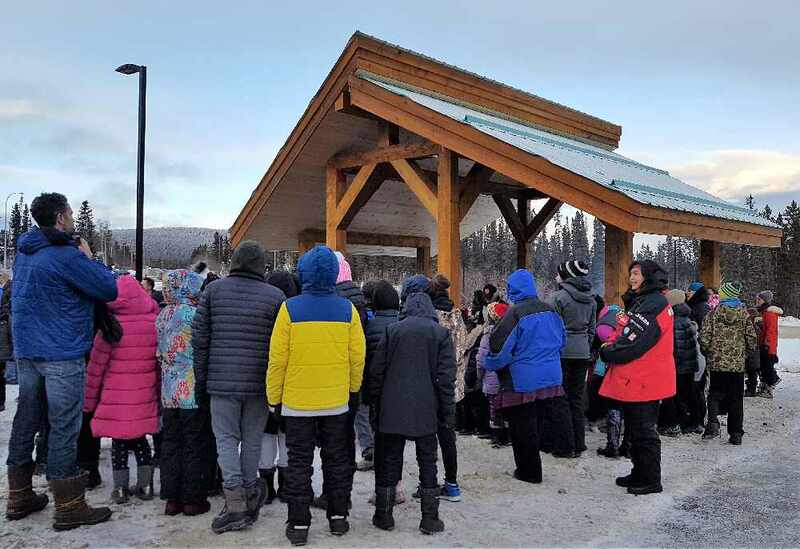 A ceremony was held Monday to mark the completion of the wood-beam shelter, which covers a fire pit, and surrounding concrete seating area in front of the school. Vice-Principal Jim Snider says the idea came from former principal Melanie Bennett, and is a part of forging ties with the Kwanlin Dün First Nation, and the school's experiential learning model. "It can be used as a gathering place for people to go out during classes, it's going to be used for ceremony, (and) it's also used for meetings before and after school." Snider said. "User groups also use the fire pit now, and it's just going to open it up to a lot more people and times of the year when it can be accessed and used." KDFN Elder Councillor William Carlick says this is a way to teach the younger generation about the power and spiritual significance of fire. "A lot of things are happening globally (with) the environment." Carlick said. "These young children--knowingly or unknowingly--are going to be living through all that. There's going to come a time where they going to have to have some way to ask for help and through the sacred fire they'll be able to get they help they would need." The shelter was built by Randy Merkel and Tuya Construction over the span of a few weeks this fall.